In good time for the festive season, a new Bugatti showroom is being opened today. Located in the centre of the famous Swiss mountain resort of Gstaad, the showroom is one of the brand’s largest in Europe, with an area of 150 square metres. Bugatti Gstaad is the 13th Bugatti showroom in the world to feature the new, award-winning brand design. Bugatti’s sales partner in Gstaad is Pichler GFG AG. In Switzerland, Bugatti has a total of three dealerships, in Geneva, Gstaad and Zurich. Bugatti is presenting its 1,500 PS super sports car, the Chiron, in Gstaad for the first time. The Chiron can be viewed in the new showroom during the festive season up to the beginning of next year. More than 10 of the over 200 advance orders received for the Chiron to date have come from Switzerland. Traditionally, Switzerland is one of Bugatti’s most important markets in Europe, together with Germany and the UK. 10% of the 450 Bugatti Veyron super sports cars sold throughout the world are in the hands of Swiss customers. Brothers Othmar and Erich Pichler established Pichler GFG AG in 1988. For more than 25 years, the Pichler name has stood for sales and service expertise in the field of premium and luxury automobile brands in Gstaad. Pichler GFG AG has been an official Bugatti partner in Switzerland since 2010. Bugatti’s new showroom in Gstaad has an area of 150 square metres and is a further example of the successful implementation of the brand identity in showroom design, for which Bugatti won an award from the German Design Council in this year’s Automotive Brand Contest and other International prizes. The Chiron is on show in Gstaad for the first time and can be viewed from 22 December through the festive season to the beginning of 2017. 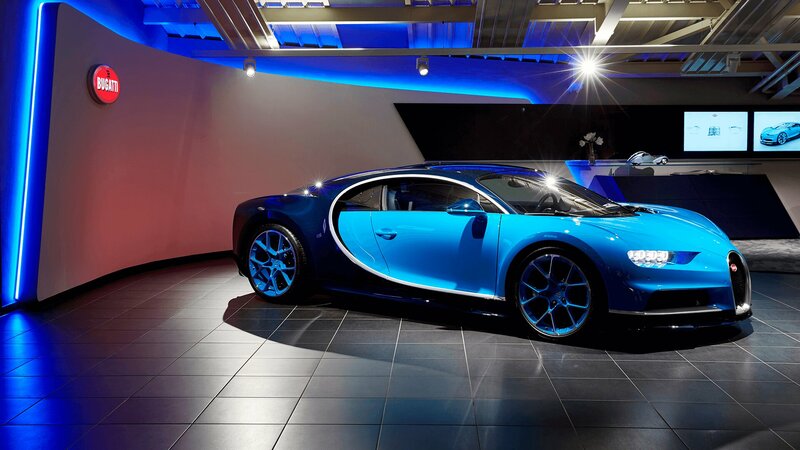 Monday - Friday: 7:30 a.m. – 12:00 noon and 1:30 p.m. – 6:00 p.m.
Blue, the brand colour of Bugatti, dominates the modern presentation of each showroom which is defined by prominent lines and clear surfaces. © 2016 Bugatti Automobiles S.A.S. Each showroom features furniture from the Bugatti Brand Lifestyle collection designed especially for the brand’s new showrooms and which customers can also purchase. © 2016 Bugatti Automobiles S.A.S.